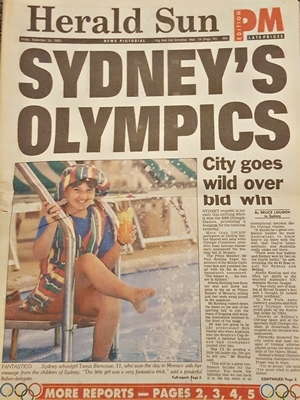 It is 25 years since the Monte Carlo announcement of Sydney as the host city of the 2000 Olympic Games. Sydney won the vote of International Olympic Committee (IOC) members against competing bids by Beijing, Berlin, Istanbul and Manchester. Speeches by the Prime Minister Paul Keating and his wife Annita, New South Wales Premier John Fahey, Olympic champion Kieren Perkins and bid chief Rod McKeogh were overshadowed by that of 11-year-old schoolgirl Tanya Blencowe, who won the crowd over with her impassioned plea for the world to come to Sydney in the year 2000. 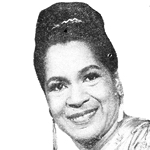 The day was also the beginning of a long-running TV tradition. 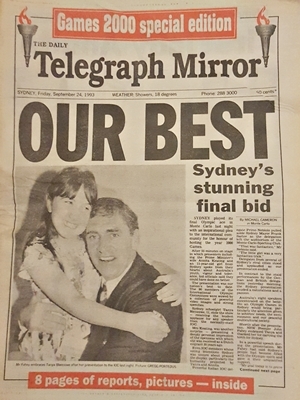 Sydney’s The Footy Show, a Sunday afternoon program, was presenting a Grand Final eve special edition in prime time. 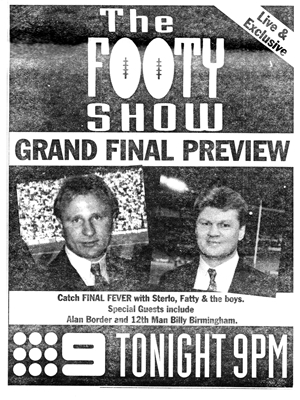 Like the Melbourne show of the same name, The Footy Show would go on to become a regular prime time fixture from 1994 onwards. 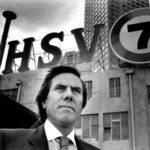 Monday 11 February 2002 — MELBOURNE Shafted begins. Winter Olympics from Salt Lake City. 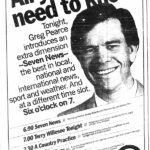 18 July 2016 Classic TV Guides: Bert Newton around the dial!